Trainor Dance performing Faux Pas. Photo by Paul B. Goode. BOTTOM LINE: Trainor Dance, in its fifth season, has established its beautiful taste in dancers and David Quinn's exceptional costume work. Caitlin Trainor's excerpt from Faux Pas began with skirts hanging from the ceiling. The dancers started by wriggling into the skirts and pulling them over their torsos. The male and female dancers flipped their skirts wildly back and forth. As you watch this piece, the skirts feel like colored fireworks that light up the space. 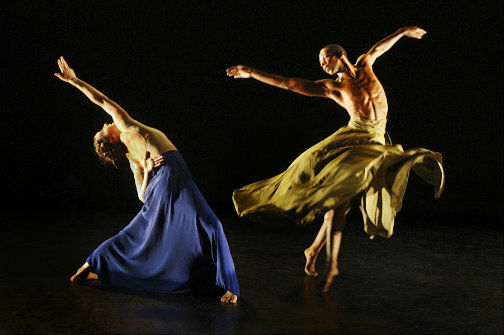 You can see Trainor's influences range from Mark Morris's musicality, to Graham and Cunningham—fairly classical modern dance. Her work is full of lines, arms slicing and tumultuous shifts of weight. Faux Pas ends with a melodramatic scene of a girl throwing her skirt over her head. Without the context of the piece to frame it it was puzzling, although pleasant to watch. Dear Friends is a duet created by Take Ueyama for Trainor and Brynt Beitman. A light box contained them as an intimate and troubled pair, set to the a capella singing of Suzanne Vega. As the lights went up on a bare stage, loud applause filled the empty space like a black curtain until the dancers entered. The dancers laid half in and out of the light. The inventive floor work combined with the lighting formed a sort of moving rendition of exquisite corpse, a drawing game that connects three different parts of the body in unexpected ways. This quirky piece vacillates from violence to intimacy and questioning. Landes Dixon's velvety arms stood out in Sandpainting as they rippled like waves bringing dancers onstage. Sheer white panels covered gold painted shorts on the dancer's bodies. Again, the stellar work of David Quinn's modern but fantastical designs propels Trainor's work into another realm. The dancers moved like shells and bits of sand to the music and wind chimes of Paul Lansky's threads. They seemed like bits of beach glass polished as the piece went on. My favorite piece in this evening was also my least favorite piece. (In)visible, with white, tight-fitting costumes again by David Quinn, recalled the Jetsons with their sweeping round hoops and forms. The jarring music was turned up so high that it sounded like a fire alarm was going off with piercing sounds. So Takahasi's score 30/30, might not have been so harsh if the volume hadn't be up so high. The sweeping patterns of the dancing were her best work so far, and they allowed the dancers to utilize their subtlety. Of note was Beau Dobson magnetized from one side of the stage to the other, with his masculine and graceful dancing. The dancers were all strong and technical, including Michael Rivera, who threw himself off his leg with such gusto that if not performed by a technician would tear muscles. Emily Craver's strong arms catapulted men up into the air, like a bag of groceries. I felt all my senses assaulted when the strobe lights came on, however. I like to think of special effects bringing the audience closer to the experience. This did the opposite. Overall, it was an evening of passionate dancing.